Alborosie and the Shengen Clan play with DJ Jacques & Guacamole on Thursday, April 18, at the Mystic Theatre. 23 Petaluma Blvd., Petaluma. 9pm. $30. 707.765.2121. ITALIAN-GROWN Alborosie's the first to admit he's a new-school artist. "Jamaica has a tradition with pirates," Alborosie once told the Jamaica Star. "To me, being in Jamaica you have to be a pirate as a European." As an outsider, learning to move without invading another's space, led the Italian rude-boy-turned- Rastafarian to focus on raw and honest subject matter. From his studio in Kingston, Jamaica, Alborosie pauses between tracks to consider his last tour, a nearly sold-out run of Argentina last month. "Latin American people are clean-hearted. But I see nuff sufferation—same like Jamaica. I hope reggae can bring some positive vibes into people's lives and upliftment, like how it help down here in JA." Born Alberto D'Ascola, Alborosie emigrated from his native Sicily to the island of Jamaica in 2000, already a seasoned performer. Under the moniker "Stena," his previous band, Reggae National Tickets, made eight records for BMG Italy. Searching out the real roots, Alborosie set up shop in Kingston working as a producer and sound engineer for the likes of Sizzla, Luciano and Gentleman. A solo career took off when legendary U.K. sound selector David Rodigan named his single "Herbalist" the 2006 song of the year, prompting Alborosie to become the first white artist distributed by Bob Marley's Tuff Gong Records. His dreads are 20-years long, his Italian-tinged patois is legit, and his music is backed by some of the most respected in the industry. 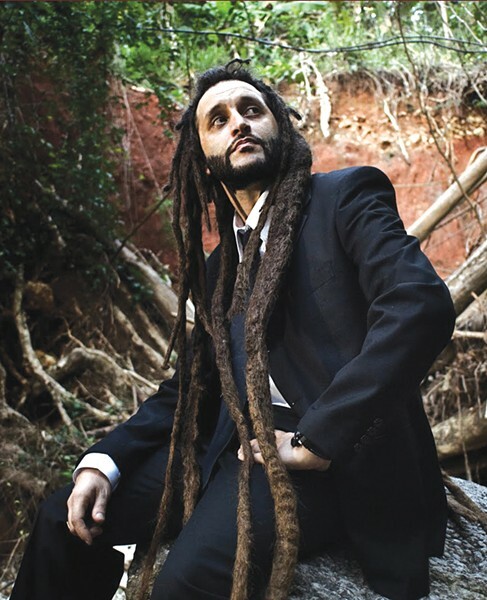 Yet Alborosie is quick to acknowledge he is new-school, merely absorbing inspiration from the original roots makers. And the multi-instrumentalist wears his influences on his sleeve: Burning Spear, Black Uhuru, Bob Marley. Across the board, his tunes are laced with 1970s and '80s "conscious" lyrics and one-drop rhythms, mixing in dancehall, dub, and Latin beats. It has been two years since the release of Alborosie's 2011 record, 2 Times Revolution. The album received both praise and flak for the expanse of rhythms it covered. "Reggae music at 360 degrees," he told Oufah Media last month. "Rub-a-dub, roots, Cuban, hip-hop, everything else—it's still reggae, still Alborosie." Alborosie's new album drops in June. Featured are the Abyssinians and Ky-Mani Marley, but more exciting is Italian rocksteady vocalist Nina Zilli. Linking up with fresh artists keeps the music accessible, especially for the West Coast scene—Humboldt County's Jah Sun dominated 2010's chronic mafia tune "Ganjah Don". As for Alborosie coming back to the best coast, "In Cali, people love reggae. Straight connection between Cali and Jamaica from the late 1960s," he says. "Plus the homegrown is wicked."